I will be 50 in December and I think I may be perimenopausal. I am all over the place with my monthlies and my head. 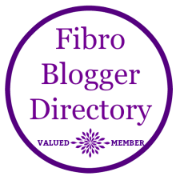 What I didn't know was a lot of Fibromyalgia symptoms are the same as the symptoms of the Menopause hey who knew! So recently I started to wean myself off my Amytriptiline as I was really scared of the onset of dementia. I did a post here. What must of been happening was the doubling up of symptoms..........well I hope so anyway. I am now down to 1 tablet from 3 with the meds and I must say I feel a lot sharper than before. I even did the countdown numbers quicker than the contestants and had a few 7 letter words unheard of in recent months! I was looking for relief of the menopause symptoms when I came across the ladycare magnet thing here. As you can see there are a lot that cross over so perhaps they were just making bad things worse. I will continue to wean myself off the meds and see how I go memory wise and I may even give the magnet a try for the rest. Anyone else been through or going through this notice the same? Labels: amytriptiline, constant pain, dementia, exercise. Pain. Disability., fibromyalgia, Fibromyalgia Friday, memory loss, menopause, perimenopause, problems with the phone. memory. dementia. CFS. My mom had a hard time with early menopause (she had a hysterectomy at 34 for endometriosis) because it mimicked a lot of her fibromyalgia symptoms. Yep! been there, done that... earlier than 50. Don't even want to think about it as it was so bad and magnified all my fibro symptoms and added a few more like the hot flushing. I thought I was heading in that direction too, maybe slightly early at 43 but I was having some tests and it seems not, even though the monthly have become less often and lighter... bodies can be just bizarre. Im 51 yo now and menstruation is still all over the place. Hate it. Yes it can be a double whammy. I had a hysterectomy at 44 due to endometriosis and on-going problems, which sent me into menopause. The worst menopausal symptom that really messes with my fibro is the insomnia. And after several years, I have finally found the right hormone therapy to help with many of those things.